The NAASCA organization is grassroots, and operates as a not-for-profit effort that belongs to no other group, yet cooperates with everyone who’s involved in the prevention, intervention or recovery from the issues of child abuse and trauma. We offer complete attribution when using material from anyone else. As such we provide literally thousands of resources and articles on hundreds of NAASCA web pages. PREVENTION — An educated, informed child and an abuse-aware community are the least likely to become victims of predators .. and these criminals are in every group, in every locale and come from every walk of life. They cleverly hide among us by grooming both child and adult into complicity. It’s important we walk through the fear of educating our kids about the issues that will face them all, in age appropriate steps, from the earliest age. INTERVENTION — We believe recognizing the non-physical signs of child abuse and trauma is an important responsibility of ALL adults. Children are innocent, vulnerable and confused. It’s up to us to look for the many changes in behavior, attitude and performance an abused child displays. We need to learn to talk calmly with a damaged child, and what to do when our suspicion of trauma is confirmed .. how and where to report it. RECOVERY — NAASCA recognizes there are many roads to recovery and doesn’t promote any single process. We promote them all. We offer the hope of healing to adult survivors from every walk of life. We gladly explain the various available styles and programs of recovery, and we’ll assist anyone we can with finding the one that’s most comfortable for the individual. We’ll be glad to share our personal stories, too .. our experience, strength and hope. Many of us are available to connect with you by phone or email. Anyone with a need to share, or who seeks info on our work, can avail themselves with the opportunity to approach the NAASCA volunteers listed on our website’s CONTACT page. 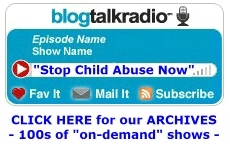 Be sure to take advantage of the many hundreds of recommended “Stop Child Abuse Now” talk show ARCHIVES which you an access “on-demand” simply by selecting the guest or topic you’d like to hear about. You’ll also see our upcoming already booked episodes listed there. Well done. If we can help the adults who suffered as children we will surely figure out the best path to helping the children.